Who LOVES talking about their Grange? I DO! I talk Grange to everyone, everywhere. I talk Grange to my family, my friends, my co-workers, people I do not even know. I love seeing people’s faces as I tell them the impact our Granges have on their communities. I tell them about our community service, the various projects our Granges are working on, the staggering number of hours each of you invest into the community. Most people are impressed with our rich history, the length of time many of our members hold their membership. Who isn’t proud of their membership? Who isn’t proud of the accomplishment of their Grange and its members? If you are, tell everyone. Don’t keep your pride in our Grange a secret. Tell EVERYONE. Every member is an ambassador for our Grange and through our positive communication to the public, the public will be better aware of us and that awareness will lead to them asking questions about the Grange, and hopefully wanting to join. Always leave a conversation about the Grange by asking them if they want more information or are interested in joining. 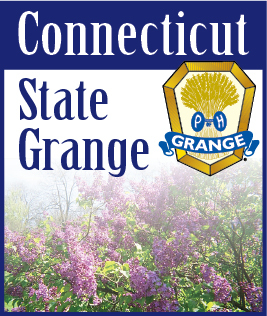 Your State Grange had an informational booth at the CT State FFA Convention held in May at the Ledyard High School, thanks to Nancy Weissmuller and Jaimie Cameron who did a great job marketing the Grange to this age group. Many asked for more information, we will be contacting each of the folks and follow up with an invitation to join. It is important your Grange follow up with these folks after the initial contacts are made. A positive message gains a positive reputation, a positive image and new members. Most of our Granges are taking in new member on a regular basis, programs are more entertaining and the fellowship shared is priceless. Brother and Sister, we have a GREAT story to tell, one worth being told, so don’t be afraid to tell it to everyone.